The discussion about relation between strength of concrete and water/cement ratio has discussed in many posts but aggregate/cement ratio has not yet been discussed and it is believed that this ratio is not very important. But actual situation is not always same especially when regular size of aggregate is not used in mix. 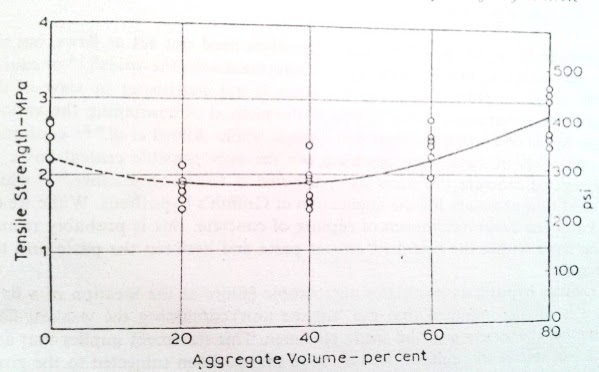 • Strength of coarse aggregates i.e. their capacity to resist superimposed stresses. Thus there have contribution of all ingredient of mix. Now come to the point “aggregate/cement ratio”-obviously this ratio is not primary factor in strength development of concrete. But it is very interesting to see that for a particular water/cement ratio, higher strength is produced by a leaner mix. The leaner mix means obviously greater aggregate/cement ratio. This behavior of concrete cannot be explained clearly. Let’s try to explain this based on change in water/cement ratio. In lean mix having large amount aggregate, obviously aggregate absorb significant amount of water from mix reducing effective water/cement ratio. We know when water/cement ratio decreases strength of concrete is increased (condition is proper compaction has been rendered). It is believed that high water content will produce more void in hardened concrete. More void will produce more porous structure. Thus lead to weak porous concrete of low strength and low durability. • Greater bond between mortar and coarse aggregate. We know high aggregate content inherently reduce shrinkage and bleeding as well which will result greater bond between cement paste and aggregate. Thermal changes due to heat generated by hydration would also be smaller. 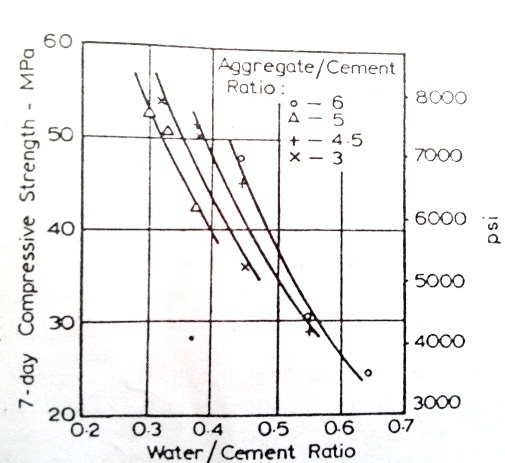 Following figure shows relation between compressive strength (7 days) and water cement ratios for different aggregate/cement ratio. 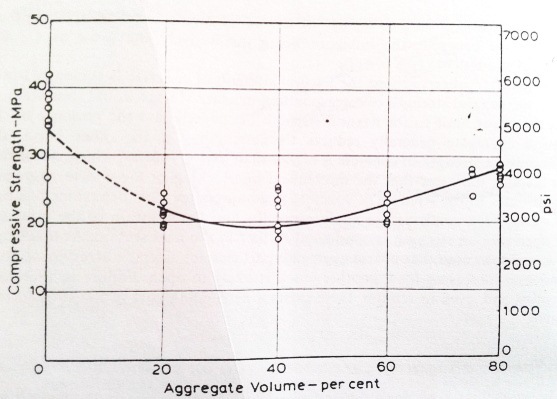 Different studies were conducted to investigate influence of aggregate content in concrete on compressive strength for a particular type of cement paste and it was found that a gradual decrease in compressive strength is associated with increasing volume of aggregate from 0~20 (volume is measured as a percentage of total volume). But from (40~80) percent there had an increase in compressive strength. Following figure clearly describes this behavior; where cylindrical samples were used (diameter=100mm.length=300mm), a water/cement ratio kept constant (w/c=0.50). The plot was based on 7-days compressive strength of concrete sample. The behavior of concrete with variation of aggregate/cement ratio is not clear and it remains unchanged with the variation of water/cement ratios. In case of tensile strength test, this influence of aggregate content is found almost identical. When cubic samples are taken, this influence is found smaller than that of cylindrical sample. Thus the ration of cylindrical strength to that of cubic sample is found decreasing with the increase in aggregate volume from (0~40) percent. This can be explained as with higher aggregate content there have greater influence on cracking pattern when end effect is absent.